Sixteen year old Pippa Greene is an aspiring photographer preparing for the competition Vantage Point, where the top two entrants will gain admission to Tisch Camp, a pre-university training course at Pippa’s dream school. She also has to volunteer at a hospital, a place that still gives Pippa panic attacks — literally — ever since her father’s unsuccessful battle against cancer. Pippa is also keeping a secret from her best friend/aspiring supermodel Dace: despite their long-ago pact to be a fashion photographer/supermodel tandem, Pippa finds herself drawn to a different type of photography, featuring objects that deal with the theme of memory. Finally, Pippa is torn between two boys: fellow aspiring photographer Ben and musician/potential slacker Dylan. 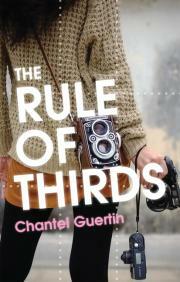 There’s a lot going on in Chantel Guertin’s The Rule of Thirds but not much reaches its potential. The love triangle is forced — it’s pretty obvious throughout whom Pippa really likes, and it’s just a matter of time before the characters figure it out too. The conflict between Pippa and Dace also seems rather forced. I do remember being a teenager, and how important such best friend pacts are. But there just wasn’t enough lead up in this book; when this situation comes to a head, I was mostly wondering where all the drama suddenly came from. Near the end, someone does something pretty horrible, and when the person explains their motives, something tells Pippa she’s still not getting the whole story. According to the back cover, this is the first book in a series, so perhaps that unresolved plot thread will be picked up in a later book, but considering the extent of the act, I wish it could have been explored more. As well, that particular plot point leads to a really far-fetched action-adventure scene, involving a drunk individual who miraculously maintains their wits and balance. Not necessarily a bad scene, but when compared to some really strong quieter moments, a disappointment. I felt special. I was the girl whose dad had cancer. Finally, I like the bits about photography. Another character makes a snarky comment about Pippa’s chosen theme of “Memory” and indeed it is beyond cliche. However, I do like how the act of taking pictures centres Pippa. The title of the book should be familiar to anyone with a visual arts background (the Rule of Thirds on Wikipedia), but it did set up the expectation that the protagonist would be a photographer extraordinaire. She is a good photographer, and certainly well-versed in the mechanics of composition (at one point, she observes that a fellow photographer’s work shows no sense of composition, and is just a regular photo of trees). However, I do wish she’d come up with a more unique theme than Memory. Something Claudia Kishi-level unexpected, but her talent makes it work. I modified the original quote somewhat to avoid anything remotely spoilerish, but the point remains. And will possibly resonate with any photographer, or any artist really, who reads this. Overall, The Rule of Thirds has some really good moments, but still ends up trying to juggle too many elements that don’t really come together. Thank you to ECW Press for an advance reading copy of this book in exchange for an honest review. This entry was posted in Book Reviews and tagged 50BookPledge2013, ARC, ECW Press, Fiction, YA by Jaclyn. Bookmark the permalink.